This protocol describes the dissection and cultivation of intact testes and germ-line cysts from Drosophila melanogaster pupae. This method allows microscopic observation of spermatogenesis ex vivo. Furthermore, we describe a pharmacological assay of the effect of inhibitors on specific stages of germ-cell development in pupal testes. Gärtner, S. M., Rathke, C., Renkawitz-Pohl, R., Awe, S. Ex vivo Culture of Drosophila Pupal Testis and Single Male Germ-line Cysts: Dissection, Imaging, and Pharmacological Treatment. J. Vis. Exp. (91), e51868, doi:10.3791/51868 (2014). During spermatogenesis in mammals and in Drosophila melanogaster, male germ cells develop in a series of essential developmental processes. This includes differentiation from a stem cell population, mitotic amplification, and meiosis. In addition, post-meiotic germ cells undergo a dramatic morphological reshaping process as well as a global epigenetic reconfiguration of the germ line chromatin—the histone-to-protamine switch. Studying the role of a protein in post-meiotic spermatogenesis using mutagenesis or other genetic tools is often impeded by essential embryonic, pre-meiotic, or meiotic functions of the protein under investigation. The post-meiotic phenotype of a mutant of such a protein could be obscured through an earlier developmental block, or the interpretation of the phenotype could be complicated. The model organism Drosophila melanogaster offers a bypass to this problem: intact testes and even cysts of germ cells dissected from early pupae are able to develop ex vivo in culture medium. Making use of such cultures allows microscopic imaging of living germ cells in testes and of germ-line cysts. Importantly, the cultivated testes and germ cells also become accessible to pharmacological inhibitors, thereby permitting manipulation of enzymatic functions during spermatogenesis, including post-meiotic stages. The protocol presented describes how to dissect and cultivate pupal testes and germ-line cysts. Information on the development of pupal testes and culture conditions are provided alongside microscope imaging data of live testes and germ-line cysts in culture. We also describe a pharmacological assay to study post-meiotic spermatogenesis, exemplified by an assay targeting the histone-to-protamine switch using the histone acetyltransferase inhibitor anacardic acid. In principle, this cultivation method could be adapted to address many other research questions in pre- and post-meiotic spermatogenesis. The development of male germ cells of many species is a sequential process. It is characterized by a series of crucial events that culminates in the formation of morphologically and epigenetically highly specialized spermatozoa. In Drosophila melanogaster, germ-line stem cells at the tip of the testis divide asymmetrically to give rise to a new stem cell and the spermatogonium, i.e., the daughter cell that is committed to differentiation (see Figure 1 for an overview)1,2. The spermatogonium undergoes four rounds of mitotic divisions and, with the onset of meiosis, a phase of impressive growth and transcriptional activity called the spermatocyte stage. The cells originating from one spermatogonium remain connected to each other and develop as a synchronized bundle wrapped by two somatic cells—a structure referred to as a cyst. After completion of meiosis, the morphology of the male germ cells is completely reorganized (schematically shown in Figure 1). Initially, round spermatids elongate to form the hydrodynamic head structure, and the flagellum develops. Eventually, the sperm cells are separated from each other by a complex, apoptosis-related mechanism called individualization3–5. In many species, including Drosophila melanogaster and mammalian species, the morphological changes of the germ cells are accompanied by a remarkable epigenetic rearrangement of the haploid male germ-line chromatin, called the histone-to-protamine switch (H-P switch)6–9. Possibly nearly all canonical histone and many histone-variant molecules are stripped from the DNA and are replaced by small basic proteins, the protamines, resulting in the highly compact nucleoprotamine structure specific to the chromatin of mature sperm. General characteristics of the H-P switch are the replacement of canonical histones first by histone variants, then by transitional proteins, and finally by protamines. All this is accompanied by several changes to epigenetic marks, such as a surge in acetylation levels of histone H4 just prior to histone removal7,10-12. Most, if not all, of the above-mentioned processes are essential for the development of mature, fully fertile sperm. This is true not only in Drosophila but also in humans, as mammalian spermatogenesis shares a considerable amount of similarity with the invertebrate system1,8,9. Studying male germ-cell development is greatly facilitated in the Drosophila model system. Flies are genetically highly accessible. The generation of mutants as well as the establishment of fly strains expressing fusion genes or RNA interference constructs takes little effort. However, in the study of post-meiotic spermatogenesis, the use of mutants and simple genetic tools could reach a limit. In Drosophila spermatogenesis, transcription ceases almost completely with entry into meiotic divisions. Thus, post-meiotic spermatogenesis is mainly based on translationally repressed and stored mRNAs synthesized in an extended meiotic prophase13-16. Therefore, tools like RNA interference or the use of non-conditional mutants are not suitable for studying specifically the post-meiotic roles of gene products that also fulfill essential functions in pre-meiotic or meiotic germ cell development. One advantage of Drosophila that can be exploited in such cases is the ability of dissected intact testes and even cysts of germ cells to develop ex vivo in culture medium4,12,17–20. The dissection and cultivation of testes or germ-line cysts allows not only microscopic observation of germ-cell development in living cells, but also the use of pharmacological assays with, e.g., inhibitors of enzyme complexes such as histone acetyltransferases (HATs), histone deacetylases (HDACs), topoisomerases, or the proteasome. Thus, it is possible to manipulate enzymatic functions during post-meiotic spermatogenesis and to monitor the developmental outcomes regardless of embryonic, pre-meiotic, or meiotic functions4,12. In pharmacological assays, we previously analyzed the acetylation-dependent localization of a bromodomain protein during meiotic prophase as well as the relevance of histone acetylation levels for the epigenetic H-P switch in post-meiotic spermatogenesis by using specific inhibitors targeting HATs and HDACs12,21. Targeting the H-P switch in these assays was made possible by using a fly strain that expresses the fusion genes histone2AvD-RFP and protamineB-eGFP12,22 in the endogenous patterns, and the observation that the first spermatids in pupal testes pass through the H-P switch between 24 and 48 hr APF12. The protocol presented describes the dissection of testes and cysts from Drosophila pupae, the culture conditions, and a pharmacological assay with intact pupal testes. For this purpose, pupal testes at around 24 hr after puparium formation (APF) are dissected (see Figures 1 and 2). At this time, the testes have not made connections to other tissues and are surrounded by only a thin outer sheath, which allows better penetration by the inhibitor compounds23,24. The testes are bean- or pear-shaped organs that can be easily taken into culture. These testes are dissected, cultured, and treated with specific inhibitors. Subsequently, the effects of the inhibitors are monitored using immunofluorescence analyses and fluorescence microscopy of fusion protein expression, and by comparison of the nuclear morphology of the treated germ cells to that of untreated germ cells. The conditions presented in this protocol also allow live imaging of developing testes and germ-line cysts in culture. The experimental procedures described in this protocol involve exclusively work with Drosophila melanogaster and are not subject to animal welfare laws in Germany. Prepare modified commercially available powdered M3 growth medium without potassium bicarbonate17. CAUTION: Irritating to eye and skin. Supplement the medium with 10% fetal bovine serum, 100 U/ml penicillin, and 100 µg/ml streptomycin. Use heat-inactivated and insect-culture-tested fetal bovine serum for best results. Filter the complete medium (referred to hereafter as medium) through a 0.2 µm bottle-top filter unit and store in aliquots at -20 °C. Before use, filter (0.2 µm syringe filter tip) the medium again to remove precipitates. Prepare inhibitor stock solutions for the pharmacological assays. Dissolve the chemicals in the appropriate solvent and store in aliquots. For example, prepare a stock solution of 28.69 mM anacardic acid (CAUTION: Irritating to eye and skin) in dimethylsulfoxide. Prepare tools for the disruption of dissected pupal testes and dissection of single cysts. Use two sharp and stiff needles, rather than a pair of forceps. The capillary force that develops between the two arms of a pair of forceps makes the dissection of single cysts in small amounts of medium very difficult. For example, use the tip of a stainless steel insect pin inserted into an inoculation loop holder. In order to obtain appropriately aged pupae, seed ca. 10 large culture vials (tubes with 4 cm diameter) with a sufficient number of adult flies (ca. 40–60 flies). 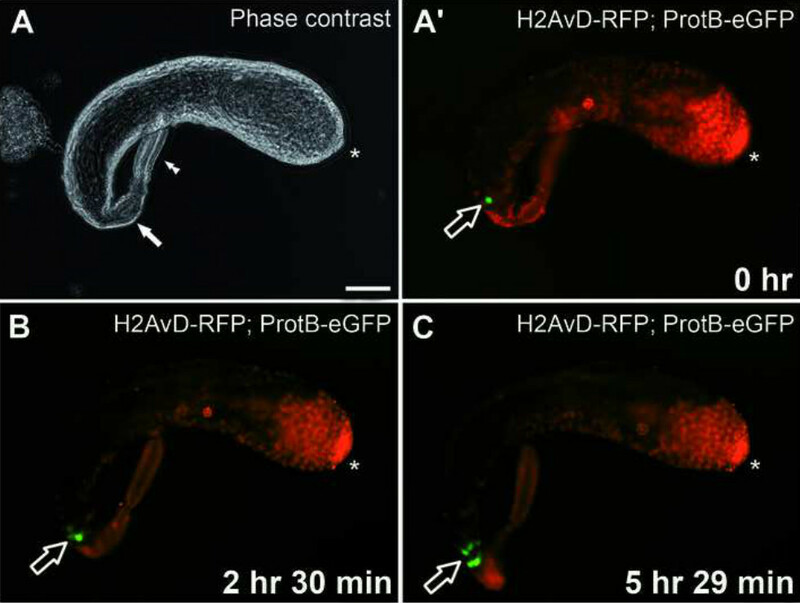 To analyze the H-P switch, use flies expressing H2AvD-RFP and ProtamineB-eGFP in their endogenous pattern12,16,22. Incubate the vials under standard conditions at 25 °C for ca. 4–5 days until third-instar larvae crawl up and start pupation on the walls of the vials25. To test the influence of certain chemicals on the H-P switch, dissect pupal testes at ca. 24 hr APF12. To obtain staged pupae, take the prepared fly culture vials with pupating larvae (see section 1.4) and identify as many white pre-pupae as possible. Pre-pupae during the very first step in pupation appear as motionless, non-feeding, rather shortened larvae with everted spiracles and white-colored puparium. The puparium becomes tan-brown within 30 to 60 min, which indicates the next stage of pupal development26. Mark the positions of the pre-pupae with a permanent marker on the outside of the vials. Incubate the vials at 25 °C for ca. 24 hr. Alternatively, pick the pre-pupae from the side of the vials with a small brush moistened with PBS buffer. Then transfer the pre-pupae to the side of a fresh 50 ml reaction tube and incubate at 25 °C for ca. 24 hr. Distribute several drops (ca. 80 µl each) of medium on a 10 cm plastic cell culture or Petri dish. Using a broad pair of forceps or a brush moistened with medium, pick the pupae at the 24 hr APF stage from the incubated vials (see section 2). Transfer one pupa to each drop of medium on the dish. For the dissection, use a stereo-microscope equipped with a fiber-optic illuminator. Do not heat the testes above RT during the dissection as this might prevent proper development in culture. Dissect pupae with two pairs of No. 5 forceps. With one pair, grab the pupa at its most posterior part (the posterior spiracles) and hold it in position. Grab the anterior spiracles with the other pair of forceps and open the pupal operculum at its anterior end. Peel off the pupal case until at least part of the thorax is exposed. Continue to hold the pupa in position by its most posterior end. To release the internal pressure of the pupa, insert both arms of a pair of forceps into the head region of the pupa. Rip the pupa open by opening the forceps and moving the forceps in the anterior direction. Ensure that the opening generated with this movement is as large as possible in the first attempt. Avoid damaging the pupa at its posterior end before the pressure has been released as this might result in the testes being pushed directly through the small opening and most often being disrupted. Observe that once the pupa is opened, the released internal pressure of the pupa presses out agglomerates of fat body cells and tissue through the large opening in the head region. Check whether the pupal testes have already been pushed out of the pupa with this material; this occurs in some cases. The testes are not connected to any other tissue at 24 hr APF and therefore might be expelled easily from the pupa23. Avoid squeezing the pupa with the forceps as this might damage the testes if they remain in the pupa. Increase the size of the opening using one pair of forceps. Then hold the pupa at its most posterior end. Close the other pair of forceps and gently streak out the contents of the pupa from posterior to anterior to release the testes from the pupa. Collect the testes by pulling them into a pre-cut 200 µl pipette tip. Try to transfer only a very small amount of medium to reduce the number of fat body cells transferred with the testes. Place the testes into medium in a fresh culture dish. Wash the testes several times with medium until only few fat body cells remain. For live imaging, transfer testes to a glass-bottom culture dish with medium and use an inverted imaging microscope. For pharmacological assays, continue with step 5. Transfer one or more pupal testis to a glass-bottom culture dish. Use a stereo-microscope with fiber-optic illumination and two stainless steel needles (see section 1.3) for the dissection of male germ-line cysts. With one needle, carefully try to pin down one testis at its anterior or posterior end. Hold it in position. Insert the other needle into the testis and disrupt the testis sheath by moving the needle sideways. Many of the cysts will be released from the testis by this movement. Continue to hold the testis in position with one needle. Gently streak out the remaining cysts from the testis with the other needle. Separate aggregated cysts either by gently moving a needle sideways through the cluster of cysts or by transferring the cysts to a fresh culture dish with medium using a 200 µl pipette tip. Move the culture dish to an inverted imaging microscope for live imaging of single cysts. Disperse cysts again with a needle if necessary. Identify the stage of the cysts by using phase-contrast and fluorescence microscopy. Focus on a cyst of the desired stage. Confirm focus and position of the cyst frequently during longer imaging experiments, as the cysts do not adhere to the bottom of the culture dish and therefore tend to float out of focus. NOTE: Coating the dish with poly-L-lysine for immobilization is detrimental to the development of early germ-line cysts. Instead, individual cysts can be isolated. With some practice, it is possible to single out a particular cyst by very gently pushing it with the needle. This will allow the transfer of single cysts to separate culture dishes with a glass Pasteur pipette with a drawn-out tip that fits into the field of view of the microscope. The isolated cysts then can be easily relocated in the culture dishes even after long-term incubation. Fill each well of a 24-well cell culture plate with 500 µl of medium for one experiment of 12 replicates. Transfer one pupal testis to each well, using a pre-cut 200 µl pipette tip. Check for the presence of protamines in the isolated testes using an inverted fluorescence microscope. The testes should be free of ProtamineB-eGFP signal, which indicates that the H-P switch has not taken place in any of the cysts. Replace testes that already show ProtamineB-eGFP-positive cysts. To the first 12 wells, add 500 µl of medium containing diluted inhibitor compound (anacardic acid) to reach the desired final concentration (150 µM) in 1 ml of medium per well. Use the remaining wells as untreated controls; add 500 µl of medium with the same amount of solvent used as with the inhibitor compounds. Note: If many different compounds and solvents are used, it might be more efficient to use medium alone as control and to test the influence of increasing solvent concentrations in separate experiments. Incubate the plate at 25 °C for 24 hr in the dark. Check again for the presence of protamines in the incubated testes as described above. The control testes should now show one or more ProtamineB-eGFP-positive cysts, which indicates transition through the H-P switch. Using a pipette with a 200 µl tip, transfer the testes to poly-L-lysine-coated slides, make squash preparations and stain with appropriate fluorescent antibodies as described elsewhere12,27,28. The testis in Drosophila males is already formed in the embryo and persists in the body cavity during larval stages. Third-instar larvae show small, round testes surrounded by a layer of future pigment cells and embedded in fat body tissue (Figure 2A). Testes in adult male flies are long, coiled tubes, which are covered by a layer of muscle cells originating from the genital disc and a pigment layer24. Interestingly, larval testes contain only germ-line cells of pre-meiotic and meiotic stages until the primary spermatocyte stage, which corresponds to meiotic prophase (see also Figure 1)23. The first cohorts of male germ cells pass through meiosis during puparium formation. At ca. 24 hr APF, post-meiotic stages with elongated flagella have already developed, and all nuclei contain histone H2AvD-RFP (Figures 1 and 2B). None of the spermatids have undergone the H-P switch as no ProtamineB-eGFP signal can be detected by fluorescence microscopy (Figure 2C). Frequently, the testes dissected at this stage contain an auto-fluorescent structure of variable size reminiscent of an agglomerate of fat body cells or one to several drops of oil (Figure 2C, arrowhead). This structure within the testis is also visible with phase-contrast microscopy. To date, we have not found any description of its nature in the literature. Testes dissected at 36 hr APF appear elongated and in some cases already begin to curl (Figure 2D). They have already attached to the tissues of the genital tract growing out from the genital imaginal disc23,24. Furthermore, they frequently contain the first spermatids beyond the H-P switch, as indicated by the ProtamineB-eGFP signal (Figures 1 and 2D, arrow). At 48 hr APF, the testes have further elongated and clearly start curling at the proximal end. Several germ-line cysts with protamine-positive nuclei become visible (Figure 2E, arrow). When testes dissected at 24 hr APF are kept in culture for 24 hr, they do not elongate as in the intact fly (compare Figure 2D and 2E with Figure 6A’). This is possibly due to a lack of positional and growth signals normally sent from the developing genital tract contacting the testis at its posterior tip23,29. Furthermore, the muscle layer of the testis sheath does not develop because nascent myotubes cannot migrate from the genital disc to the testis24. The testis sheath—in this situation solely the thin pigment layer—does not seem to grow sufficiently in culture to envelope the increasing number of developing germ cells within. However, germ cells grow, divide, and differentiate independently of the testis sheath. Hence, after more than 36 hr in culture, the early testes will frequently burst open, and further development is not observed. However, within a shorter time frame, it is possible to record time-lapse ex vivo live images of whole testes developing in culture, as evidenced by Figures 3A-3C (see also Supplemental video 1). A pupal testis, dissected at ca. 45 hr APF, was incubated in medium for 6 hr and imaged every 5 min. Within this time frame, several cysts of spermatids emerge from the H-P switch stage and show a bright ProtamineB-eGFP signal (Figures 3A’-3C, open arrows). As mentioned above, male germ cells in the Drosophila testis develop as synchronized bundles of interconnected cells, named cysts1. Figure 4A shows an overview of cysts dissected from a pupal testis at around 24 hr APF. 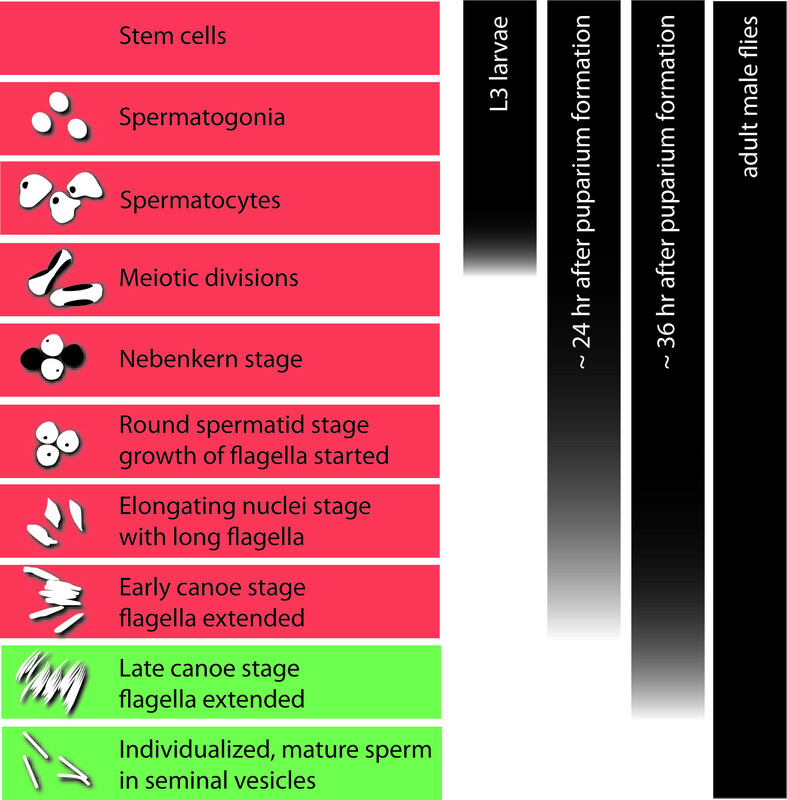 Pre-meiotic stages, meiotic stages, early post-meiotic stages, and also cysts in the early canoe stage with elongated nuclei prior to the H-P switch can be found (Figures 1 and 4B-4E). The isolated cysts are very fragile and should be handled carefully. The two somatic cells that form the cyst’s envelope can be easily disrupted mechanically. Germ-line stem cells have the ability to survive and continue dividing after genetic ablation of the somatic cyst cells in vivo30. It has been reported that in vitro, germ cells of the 16-cell stage separated from their somatic envelope further develop and differentiate19. Indeed, we noticed in our culture system that presumably late spermatocytes completed meiotic divisions with disrupted cyst cells, albeit very infrequently. Most frequently, these disrupted cysts ceased development. Following the presented protocol, intact cysts might in some cases develop ex vivo in culture medium for a maximum of 72 hr. However, we observed that a reasonable number of cysts survive up to 48 hr of incubation. Within this time frame, the cultured cysts are able to develop from the primary spermatocyte stage until after meiotic divisions as well as from the round nuclei stage with histone-based chromatin until the late canoe stage beyond the H-P switch12. This allows live imaging of vital processes in spermatogenesis, as for example, spermatocytes entering meiotic divisions (Figure 5 and Supplemental video 2). For this experiment, the RFP-tagged histone variant H2AvD was used as chromosome marker. The primary spermatocyte stage extends for ca. 3 days in vivo31. Therefore, in order to record meiotic divisions, we chose cysts with spermatocytes that had visibly started chromatin condensation (Figure 5A, region 2). Meiotic division starts in spermatocytes on one side of the cyst and then follows in a wave in the remaining spermatocytes (in Figure 5A from region 2 to region 1, also see Supplemental video 2). Condensation of the chromatin soon leads to fast-moving chromosomes that are visible as bright spots (Figure 5A, region 2). After 30 min, the first spermatocytes of this region are already in telophase (Figure 5B, arrowheads). The chromosomes of the younger region 1 arrange at the metaphase plate 20 min later (Figure 5C). They complete telophase and are ready to undergo cytokinesis about 15 min later (Figure 5D). Anaphase, telophase, and cytokinesis lasted ca. 10 min in this recording (Supplemental video 2). In mammals, as well as in Drosophila, a pronounced increase in histone H4 acetylation marks the onset of histone removal and the H-P switch during post-meiotic spermatogenesis6,11. It has been proposed that this epigenetic modification is an essential component or even trigger of the developmental program of the H-P switch10,32. Previously, we treated Drosophila pupal testes in culture with inhibitors targeting HATs and HDACs to influence the acetylation level of histone H4 during post-meiotic stages12. In these pharmacological assays, we found that histone acetylation is essential for the progression of spermatogenesis from stages with histone-based chromatin to stages with protamine-based chromatin. Figures 6 and 7 show representative results of a pharmacological assay using anacardic acid to target HATs in pupal testes. Testes at 24 hr APF were dissected from a fly strain expressing H2AvD-RFP and ProtamineB-eGFP. 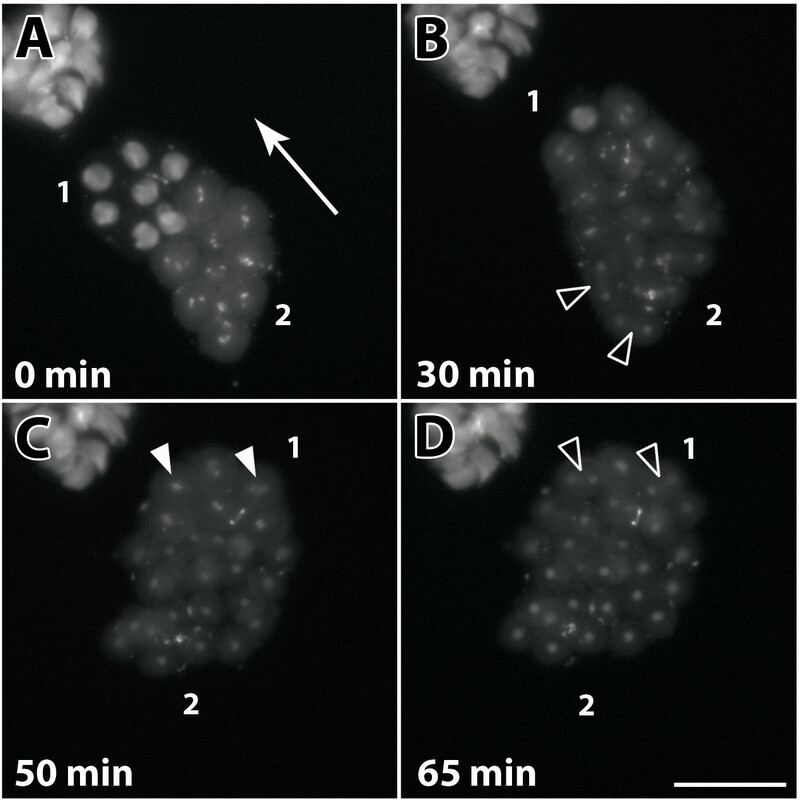 ProtamineB-eGFP protein was absent in these early pupal testes (Figure 6A and B). After 24 hr in culture, the control testes showed ProtamineB-eGFP signals, which indicated that the first cysts had developed beyond the H-P switch (Figure 6A’, open arrowheads). This was not the case with the testes treated with 150 µM anacardic acid (Figure 6B’). Testis squash preparations and immunofluorescence analyses offer more detailed information (Figure 7). In the untreated control, the nuclei of the relatively large primary spermatocytes can be recognized by their characteristic pattern of three regions of richly stained DNA, which correspond to the major chromosomes (4C level) of Drosophila (Figure 7A, column 1). Acetylation of histone H4 is clearly detectable at this stage (Figure 7B, column 1). The first stage after meiotic divisions is known as the Nebenkern stage and is characterized by rather large, round nuclei (see Figure 4C; not shown in Figure 7). The next stage shown in Figure 7 is identified by flagellar growth and the round shape of the germ cell nuclei, which are already much smaller than in earlier stages (Figure 7A, column 2) and show very low to nearly undetectable levels of histone H4 acetylation (Figure 7B, column 2). The round shape then elongates (Figure 7A, column 3), and the acetylation of histone H4 is again clearly detectable (Figure 7B, column 3). The spermatids then reach the canoe shape stage in which the H-P switch takes place and histones are replaced by protamines (Figures 7A-7C, columns 4 and 5). Following the canoe stage, the protaminated nuclei then further elongate into a very thin needle shape in the mature sperm (not shown here). Testis squash preparations of testes treated with anacardic acid showed different results (Figures 7D-7F). The chromatin in germ cells treated with anacardic acid appeared more condensed than that of the untreated control (compare Figure 7D, treated and 7A, control). 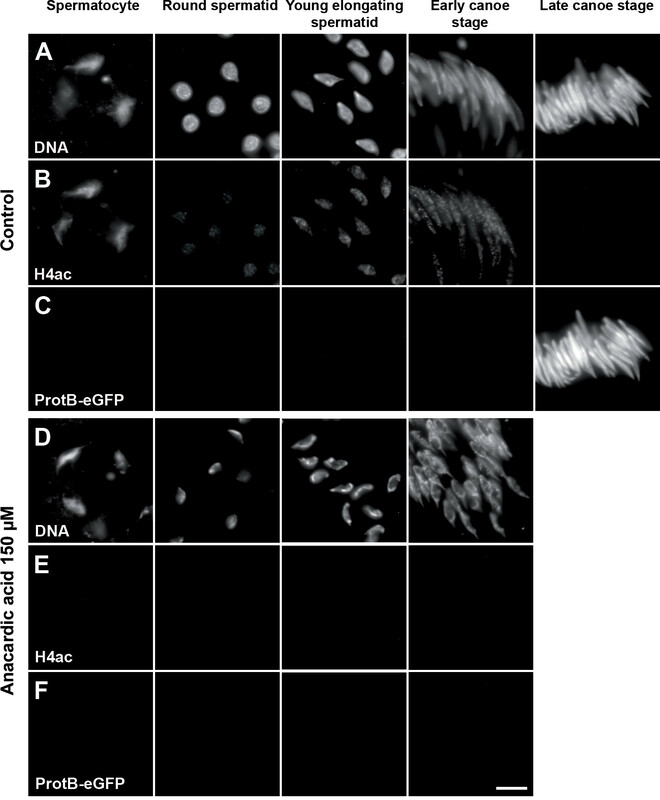 Immunofluorescence analyses revealed that acetylation of H4 was greatly diminished or even absent in nuclei of germ cells treated with anacardic acid (Figure 7E). It is known that highly acetylated histones are associated with regions of open chromatin, while chromatin regions that lack histone acetylation frequently show a repressive structure33. Therefore, it is not surprising that treatment with anacardic acid influenced the chromatin structure of the treated germ cell nuclei. Importantly, no protamine-positive nuclei of late canoe stage or beyond were identified in treated testes (Figure 7F). Thus, our data are consistent with the idea that HAT activity is essential for spermiogenesis to proceed from histone-based chromatin to protamine-based chromatin stages. Figure 1. Overview of Drosophila spermatogenesis. The left panel displays the sequence of stages in germ-cell development from a stem cell to individualized sperm. Schematic drawings show the characteristic nuclear morphology of the germ cells. One spermatogonium divides to produce 16 interconnected spermatocytes in one cyst. During this stage most of the transcripts needed for post-meiotic development are produced, translationally repressed, and stored. The bulk of transcriptional activity ends with the entry into the meiotic divisions. The histone-to-protamine switch in the chromatin takes place between the early and late canoe stage. Stages with a histone-based chromatin are highlighted in red; stages with a protamine-based chromatin are highlighted in green. The bars in the right panel indicate the stages of germ cells that can normally be found in the developing testis in larvae, pupae at ca. 24 and 36 hr after puparium formation (APF), and adult flies. Figure 2. Drosophila testes at different stages of development. (A) Phase-contrast image of a slightly squashed whole-mount testis of a third-instar larva (L3). Only pre-meiotic and meiotic stages can be found. Spermatogonia are restricted to the anterior tip beneath the hub region (asterisk). The remaining testis is filled with spermatocytes (open arrow). (B) Phase-contrast image of a slightly squashed testis at ca. 24 hr after puparium formation (APF). In addition to spermatocytes (open arrow), the testis contains spermatids in the Nebenkern stage (open arrowheads), with round nuclei and spermatids in elongating stages with growing flagella (double open arrowhead). (C–E) Whole-mount pupal testes expressing H2AvD-RFP and ProtamineB-eGFP (overlays of phase-contrast and eGFP and RFP fluorescence images). (C) Pupal testis dissected at ca. 24 hr APF. Arrowhead marks auto-fluorescence of putative fat body cells. D) Pupal testis dissected at ca. 36 hr APF displays the first ProtamineB-eGFP-positive cyst (arrow). (E) Pupal testis at ca. 48 hr APF with a group of ProtamineB-eGFP-positive cysts (arrow). In all figure parts, asterisks indicate the hub region. Scale bars: 100 µm. Please click here to view a larger version of this figure. Figure 3. Live imaging of the histone-to-protamine switch in a pupal testis growing ex vivo. (A) Phase-contrast image of a pupal testis expressing H2AvD-RFP and ProtamineB-eGFP taken into culture at ca. 45 hr after puparium formation (APF). The seminal vesicle is indicated by a filled arrow. A paragonium (double arrowhead) remains attached to the testis. (A’) eGFP and RFP fluorescence of the testis shown in (A). The open arrow indicates a ProtamineB-eGFP-positive cyst. Scale bar: 100 µm. (B) After 2 hr 30 min in culture, several further cysts (open arrow) emerge from the histone-to-protamine transition. (C) After an additional ca. 3 hr in culture, i.e., a total of 5 hr 29 min in culture, a group of cysts (open arrow) with strong ProtamineB-eGFP signal is visible at the proximal end of the testis. See also Supplemental video 1. In all figure parts, asterisks indicate the hub region. Please click here to view a larger version of this figure. Figure 4. Isolated cysts of germ cells at different stages of development. (A) Cysts dissected from a testis at ca. 24 hr after puparium formation (APF). Overlay of phase-contrast and H2AvD-RFP fluorescence (red) images. Scale bar: 100 µm. (B–E) Magnifications of single cysts of different stages. Overlay of differential interference contrast (DIC) and H2AvD-RFP fluorescence images. Scale bar: 20 µm. (B) Cyst of 16 spermatocytes. (C) Cyst of 64 round spermatids at the Nebenkern stage. The Nebenkern structure develops from fused mitochondria and is visible in DIC images next to the nucleus (open arrowhead). (D) Cyst of spermatids with round H2AvD-RFP-positive nuclei and elongating flagella (open arrowhead indicates an elongating Nebenkern structure that accompanies the growing axoneme). (E) Apical tip of a cyst of spermatids at the early canoe stage showing an elongated nuclear shape. The extensively elongated flagella are only partially visible. Please click here to view a larger version of this figure. Figure 5. Live imaging of a single 16-spermatocyte cyst undergoing meiosis I ex vivo. Fluorescence images of a cyst in culture expressing H2AvD-RFP. Depicted are characteristic stages of meiosis I. Spermatocytes in the cyst pass through meiotic divisions in a wave-like manner. (A) Chromosome condensation starts in nuclei at one side of the cyst (2) and progresses through the cyst (direction indicated by arrow). Nuclei in the opposing region (1) represent an earlier stage of chromatin condensation, where histone-dense regions marking the three major chromosomes can still be discerned. Spermatocytes in region (2) contain fully condensed chromosomes, visible as bright fluorescent spots. (B) After 30 min, the first spermatocytes in region (2) are in telophase (open arrowheads), while chromosome condensation continues in region (1). (C) In the last spermatocytes of region (1), the chromosomes (arrowheads) are arranged at the metaphase plate 20 min later. (D) Within another 15 min, the last spermatocytes appear to have completed telophase and are now ready to undergo cytokinesis (open arrowheads). See also Supplemental video 2. Scale bar: 50 µm. Please click here to view a larger version of this figure. Figure 6. Anacardic acid inhibits the histone-to-protamine switch in cultured pupal testes. Pupal testes expressing H2AvD-RFP and ProtamineB-eGFP and dissected at 24 hr after puparium formation (APF) were incubated for 24 hr in medium without inhibitor (control; A, A’; DMSO, dimethylsulfoxide) or in medium supplemented with 150 µM anacardic acid (B, B’). Hub regions indicated by asterisks. (A, B) No ProtamineB-eGFP-positive cysts can be observed after dissection. (A’) After 24 hr of incubation, some cysts underwent the histone-to-protamine switch and ProtamineB-eGFP-positive cysts (open arrowheads) can be observed. (B’) Testes treated with anacardic acid do not develop ProtamineB-eGFP-positive cysts. Scale bar: 100 µm. Please click here to view a larger version of this figure. Figure 7. 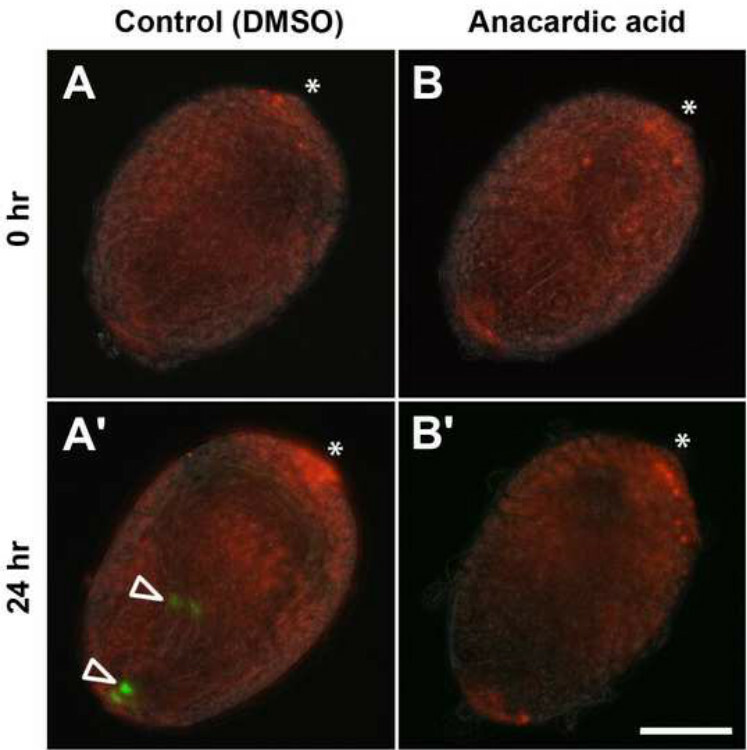 Anacardic acid affects histone H4 acetylation and the chromatin structure of spermatids. 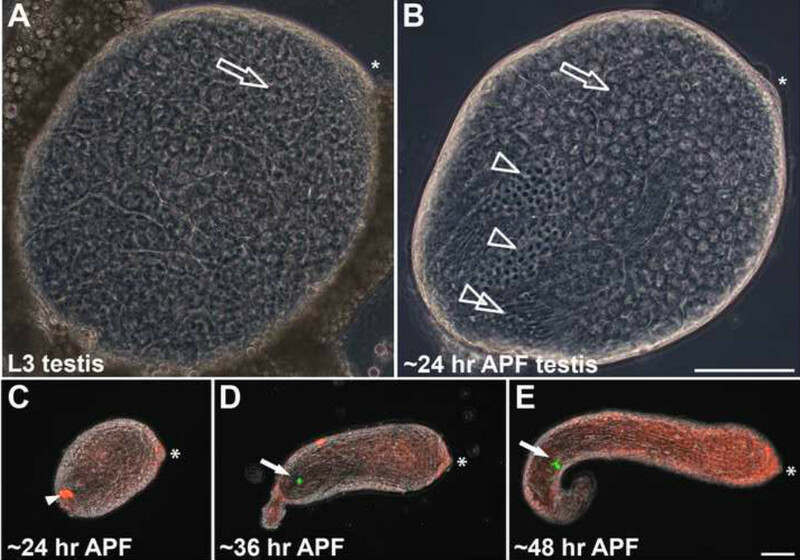 Squash preparations of spermatid nuclei from pupal testes (24 hr APF) expressing ProtamineB-eGFP incubated for 24 hr without inhibitor (A–C) or with 150 µM anacardic acid (D–F). DNA stained with Hoechst dye (A and D). H4 acetylation analyzed immunofluorescently (B and E). Presence of protamines monitored with the ProtamineB-eGFP signal (C and F). After treatment with anacardic acid, the chromatin appears strongly compacted (D) and the H4 acetylation signal is completely reduced in all spermatid stages (E). In addition, the anacardic-acid-treated testes show no cysts of late canoe stage or beyond and no ProtamineB-eGFP signal (F). Scale bar: 10 µm. Please click here to view a larger version of this figure. Supplemental Video 1. Live imaging via eGFP and RFP fluorescence of the histone-to-protamine switch in a pupal testis growing ex vivo. Video of 6 hr time course imaging illustrates the histone-to-protamine transition by the increase in prevalence of ProtamineB-eGFP-positive cysts. Images were acquired every 5 min. For details, see Figure 3. (See "suppl_video_1.MOV" under Downloads). Supplemental Video 2. Live imaging of a single 16-spermatocytes cyst undergoing meiosis I ex vivo. Time-lapse fluorescent imaging of a cyst in culture expressing H2AvD-RFP over the course of 80 min. This video depicts the characteristic stages of meiosis I. Images were acquired every 1 min. For details, see Figure 5. (See "suppl_video_2.MOV" under Downloads). The presented protocol describes two different applications based both on the ability to dissect Drosophila testes and single germ-line cysts at a given developmental stage and on the ex vivo development of these cells and tissues in a culture dish. One application is the pharmacological manipulation of vital processes during sperm development. Importantly, this allows access to post-meiotic spermatogenesis that is not easily gained using functional analyses based on fly genetics. The other application is the microscopic observation of living and developing germ cells and testes. Especially this application benefits from the ability of Drosophila cells and organs in culture to survive and develop at RT and under normal atmosphere. Hence, an inverted imaging microscope equipped with a heated stage (heating to standard breeding temperature of 25 °C) is sufficient to obtain meaningful results in live-imaging experiments. Furthermore, many transgenic fly strains expressing fluorescent protein-tagged proteins for live imaging exist or can be easily established. To obtain pupal testes or germ-line cysts of a specific developmental stage, it is crucial that one is familiar with the timing of Drosophila development. The exact timing for each stage might vary among laboratories, culture conditions, and fly strains and must be established empirically. As outlined above, this is especially important for pharmacological assays that, for example, target the H-P switch. For such experiments, it is advisable to always check for spermatids with a ProtamineB-eGFP signal before the actual inhibitor test because the timing can vary slightly even within one population. Following the protocol above should enable the experimenter to dissect testes from early pupal stages as intact organs free of attached fat body tissue. These testes and, even more so, isolated germ-line cysts are very fragile. Hence, it is crucial to develop the manual dexterity and experience necessary for handling and transferring testes and cysts using forceps, needles, and pipettes. Especially studies targeting meiotic and early post-meiotic germ-cell development would benefit from this. While it is comparatively easy to dissect cysts of late spermatids with long flagella from adult testes, it is difficult to obtain earlier stages. Dissecting these cysts from early pupal testes following this protocol is much more efficient. Keep in mind that in a usual fly strain, only ca. 50% of the pupae will be male. Therefore, prepare to dissect at least twice as many pupae as the number of testes required. Alternatively, it is possible to identify male L3 larvae using a stereo-microscope, as the testes can be identified as translucent round organs embedded in the lateral fat body tissues of the intact larva23,34, and to collect them in fresh culture vials that can be used to pick pre-pupae for staging and dissections. It is also possible to identify male pre-pupae35. We noticed that both the isolated germ-line cysts and the intact pupal testes in culture are sensitive to light, as has also been reported previously18. This light sensitivity might also hold for some chemical compounds used in pharmacological assays. Therefore, it is best to keep the culture dishes of an assay in the dark during incubation. Likewise, when planning time-lapse imaging experiments with developing testes and, especially, isolated cysts, keep in mind that too-long exposure times and/or too-high sampling rates may inhibit ex vivo development. The appropriate sampling rate should be determined experimentally. Bacterial and/or fungal infection and over-growth in the culture dishes poses a severe problem. Infected culture dishes with too many bacteria do not support ex vivo development of the testes and cysts. Therefore, the described culture medium contains penicillin and streptomycin (see step 1.1), but during long-term incubation, these antibiotics might be degraded and their activity might diminish. This could be one of the reasons for the limited time of survival (max. 72 hr) of cultured cysts observed when using the protocol above. Yet this time frame could not be extended by regular replacement of the culture medium in the dishes. We conclude that other factors might influence the survival in culture, such as a lack of growth signals from other tissues of the genital tract. On the other hand, post-meiotic development is quicker in Drosophila than in mammals. In Drosophila, spermiogenesis takes approximately 90 hr, and the H-P switch takes place between 50 and 60 hr after meiosis9,12. Thus, the usual survival time of around 48 hr achieved with this protocol is well suited to follow pivotal developmental processes in spermatogenesis, such as meiotic divisions or the H-P switch. Although bacterial or fungal contamination can be avoided by using clean tools and media, the presented protocol does not make use of strictly sterile work conditions because flies and fly testes already contain bacteria when raised under standard conditions. Nevertheless, some applications of this culture technique might benefit from flies dissected or even raised under aseptic conditions (for protocols, see 17,36,37). Pharmacological assays depend on the use of chemical compounds acting as inhibitors or activators of various enzymes. The compounds commonly used in such experiments often differ widely in their target specificity. As an advantage, this offers the potential to target whole enzyme classes, for example, with anacardic acid inhibiting p300/CBP, PCAF, and MYST family members of HATs38. The downside of this could be potential off-target or cytotoxic effects induced by such compounds. Therefore, each compound used in an assay with pupal testes or cysts should be tested for its cytotoxicity and specific effect at different concentrations. Furthermore, slight variations in the culture conditions, compound concentration or activity, and variations in the cell permeability might lead to variability of the induced effects. Therefore, it is necessary to monitor the success of the treatment in each experiment. For example, when we used anacardic acid at 150 µM, we observed slight variability in the strength of the chromatin condensation phenotype between and sometimes within some testes, while acetylation of histone H4 was consistently decreased. Pharmacological assays with Drosophila testes in culture have been used to analyze pre- and post-meiotic mechanisms of spermatogenesis4,12,14,21. Since it is difficult to access post-meiotic spermatogenesis with genetic tools to target players with essential pre-meiotic and meiotic functions, this ex vivo approach constitutes an alternative. Furthermore, in principle, the method could be adapted to pulse-chase experiments to follow the development of treated germ cells over time. However, we have not yet tested this possibility. Making use of early pupal testes is an advantage in pharmacological assays. First, the thin outer sheath of the young pupal testes (around 24 hr APF) could allow improved permeability of chemical compounds. Second, when studying the post-meiotic H-P switch, the pupal testes dissected at 24 hr APF from the Protamine-GFP-expressing fly line enable a direct readout of whether the H-P switch was affected or not. To date, several protocols for ex vivo cultivation of Drosophila organs and tissues including testes and germ-line cysts have been developed (e.g., see 4,14,17,20,39,40). The cultivation medium and the general conditions used in the protocol presented here were established in 197917. The culture system was later adapted to in vivo imaging of the individualization mechanism in late post-meiotic cysts isolated from adult testes4. Previously, we have reported that these conditions also support survival and differentiation of meiotic and early post-meiotic germ cells in their cysts for around 48 hr12. In contrast to other culture systems19 the observed developmental timing in these cultures was approximately consistent with the timing determined from fixed samples (for details, see12). H2AvD-RFP and Protamine-GFP fluorescence signals can be used to visualize the nuclear morphology and chromatin composition of the germ cells in culture. We found that for clear identification of developmental stages in culture, this is advantageous over other criteria, such as coiling of cysts. Importantly, the presented protocol does not involve addition of fly extract or other growth factors other than fetal bovine serum. Furthermore, we show here that the conditions are compatible with fluorescence microscopy imaging of meiotic divisions ex vivo in culture. Images can be obtained with reasonable resolution in an easy-to-use medium that supports long-term development. This is in contrast to protocols enabling short-term (ca. 3 hr) observations in Voltalef oil41,42. The procedures described above for cultivation and pharmacological treatment of pupal testes and single male germ-line cysts are easily adaptable to the many genetic, epigenetic, cell biological, or developmental questions that can be researched in Drosophila spermatogenesis. This includes especially research focusing on germ-line stem cells. It has been shown that stem cell development can be followed by live imaging of cultured adult testes20,43. However, the peristaltic movement of the mature testis sheath interferes with image acquisition. Therefore, either imaging is done using fragmented testes43 or the number of imaging experiments performed has to be increased to account for lost datasets20. Early pupal testes (24 hr APF) are not yet enclosed with muscle cells. Even slightly older testes (36–45 hr APF) appear to show few peristaltic movements (compare Figure 3 and Supplemental video 1). Therefore, cultivation of young pupal testes as intact organs could serve as an alternative. Furthermore, once mastered, the ability to dissect pupal testes and eventually isolated germ-line cysts will allow further applications using single cysts as a source of a homogeneous, albeit small, cell population. For example, it is thus possible to perform RT-qPCR to analyze the transcriptional regulation of specific genes during defined stages of spermatogenesis, as has already been demonstrated15. The authors wish to thank T. Noguchi for helpful advice on the initial establishment of the culture technique in our laboratory. Research in the lab of R. R.-P. was funded by the DFG within the international collaborative research center TRR81. Austerlitz INSECT PINS stainless steel needles, size 0 Plano GmbH N5018 In our hands both of these pin sizes worked well in the dissections. The minutiens are less rigid but have a smaller tip diameter. Fuller, M. T. Genetic control of cell proliferation and differentiation in Drosophila spermatogenesis. Semin. Cell Dev. Biol. 9, (4), 433-444 (1998). de Cuevas, M., Matunis, E. L. The stem cell niche: lessons from the Drosophila testis. Development. 138, (14), 2861-2869 (2011). Tokuyasu, K. T., Peacock, D. W. J., Hardy, R. W. Dynamics of spermiogenesis in Drosophila melanogaster. Z. Zellforsch. Mikrosk. Anat. 124, (4), 479-506 (1972). Noguchi, T., Miller, K. G. A role for actin dynamics in individualization during spermatogenesis in Drosophila melanogaster. Development. 130, (9), 1805-1816 (2003). Feinstein-Rotkopf, Y., Arama, E. Can’t live without them, can live with them: roles of caspases during vital cellular processes. Apoptosis. 14, (8), 980-995 (2009). Govin, J., Caron, C., Lestrat, C., Rousseaux, S., Khochbin, S. The role of histones in chromatin remodelling during mammalian spermiogenesis. Eur. J. Biochem. 271, (17), 3459-3469 (2004). Hecht, N., Behr, R., Hild, A., Bergmann, M., Weidner, W., Steger, K. The common marmoset (Callithrix jacchus) as a model for histone and protamine expression during human spermatogenesis. Hum. Reprod. 24, (3), 536-545 (2009). Kanippayoor, R. L., Alpern, J. H. M., Moehring, A. J. Protamines and spermatogenesis in Drosophila and Homo sapiens. Spermatogenesis. 3, (2), (2013). Rathke, C., Baarends, W. M., Awe, S., Renkawitz-Pohl, R. Chromatin dynamics during spermiogenesis. Biochim. Biophys. Acta. (2013). Kimmins, S., Sassone-Corsi, P. Chromatin remodelling and epigenetic features of germ cells. Nature. 434, (7033), 583-589 (2005). Rathke, C., Baarends, W. M., Jayaramaiah-Raja, S., Bartkuhn, M., Renkawitz, R., Renkawitz-Pohl, R. Transition from a nucleosome-based to a protamine-based chromatin configuration during spermiogenesis in Drosophila. J. Cell Sci. 120, (9), 1689-1700 (2007). Awe, S., Renkawitz-Pohl, R. Histone H4 acetylation is essential to proceed from a histone- to a protamine-based chromatin structure in spermatid nuclei of Drosophila melanogaster. Syst. Biol. Reprod. Med. 56, (1), 44-61 (2010). Olivieri, G., Olivieri, A. Autoradiographic study of nucleic acid synthesis during spermatogenesis in Drosophila melanogaster. Mutat. Res. Fund. Mol. Mech. Mut. 2, (4), 366-380 (1965). Gould-Somero, M., Holland, L. The timing of RNA synthesis for spermiogenesis in organ cultures ofDrosophila melanogaster testes. Wilhelm Roux Arch. Entwickl. Mech. Org. 174, (2), 133-148 (1974). Barreau, C., Benson, E., Gudmannsdottir, E., Newton, F., White-Cooper, H. Post-meiotic transcription in Drosophila testes. Development. 135, (11), 1897-1902 (2008). Barckmann, B., Chen, X., et al. Three levels of regulation lead to protamine and Mst77F expression in Drosophila. Dev. Biol. 377, (1), 33-45 (2013). Cross, D. P., Shellenbarger, D. L. The dynamics of Drosophila melanogaster spermatogenesis in in vitro cultures. J. Embryol. Exp. Morphol. 53, (1), 345-351 (1979). Rebollo, E., González, C. Time-Lapse Imaging of Male Meiosis by Phase-Contrast and Fluorescence Microscopy. Drosophila Cytogenetics Protocols. Henderson, D. S. Humana Press. 77-87 (2004). Kawamoto, T., Kawai, K., Kodama, T., Yokokura, T., Niki, Y. Autonomous differentiation of Drosophila spermatogonia in vitro. Dev. Growth Differ. 50, (7), 623-632 (2008). Sheng, X. R., Matunis, E. Live imaging of the Drosophila spermatogonial stem cell niche reveals novel mechanisms regulating germline stem cell output. Development. 138, (16), 3367-3376 (2011). Leser, K., Awe, S., Barckmann, B., Renkawitz-Pohl, R., Rathke, C. The bromodomain-containing protein tBRD-1 is specifically expressed in spermatocytes and is essential for male fertility. Biol. Open. 1, (6), 597-606 (2012). Jayaramaiah Raja, S., Renkawitz-Pohl, R. Replacement by Drosophila melanogaster Protamines and Mst77F of Histones during Chromatin Condensation in Late Spermatids and Role of Sesame in the Removal of These Proteins from the Male Pronucleus. Mol. Cell. Biol. 25, (14), 6165-6177 (2005). Bodenstein, D. The postembryonic development of Drosophila. Biology of Drosophila. Demerec, M. Wiley and Sons. 275-367 (1950). Susic-Jung, L., Hornbruch-Freitag, C., Kuckwa, J., Rexer, K. H., Lammel, U., Renkawitz-Pohl, R. Multinucleated smooth muscles and mononucleated as well as multinucleated striated muscles develop during establishment of the male reproductive organs of Drosophila melanogaster. Dev. Biol. 370, (1), 86-97 (2012). Ashburner, M., Roote, J., et al. Laboratory Culture of Drosophila. Drosophila Protocols. Sullivan, W., et al. Cold Spring Harbor Laboratory Press. 585-599 (2000). Bainbridge, S. P., Bownes, M. Staging the metamorphosis of Drosophila melanogaster. J. Embryol. Exp. Morphol. 66, (1), 57-80 (1981). Hime, G. R., Brill, J. A., Fuller, M. T. Assembly of ring canals in the male germ line from structural components of the contractile ring. J. Cell Sci. 109, 2779-2788 (1996). Bonaccorsi, S., Giansanti, M. G., Cenci, G., Gatti, M., et al. Cytological analysis of spermatocyte growth and male meiosis in Drosophila melanogaster. Drosophila Protocols. W, S. ullivan, et al. Cold Spring Harbor Laboratory Press. 87-109 (2000). Stern, C. The growth of testes in Drosophila. I. The relation between vas deferens and testis within various species. J. Exp. Zool. 87, (1), 113-158 (1941). Lim, J. G. Y., Fuller, M. T. Somatic cell lineage is required for differentiation and not maintenance of germline stem cells in Drosophila testes. PNAS. 109, (45), 18477-18481 (2012). Fuller, M. T. Spermatogenesis. The Development of Drosophila melanogaster. Bate, M., Martinez-Arias, A. Cold Spring Harbor Laboratory Press. 71-147 (1993). Braun, R. E. Packaging paternal chromosomes with protamine. Nature Genet. 28, (1), 10-12 (2001). Görisch, S. M., Wachsmuth, M., Tóth, K. F., Lichter, P., Rippe, K. Histone acetylation increases chromatin accessibility. J. Cell Sci. 118, (24), 5825-5834 (2005). Demerec, M., Kaufmann, B. P. Drosophila Guide: Introduction to the Genetics and Cytology of Drosophila melanogaster. Carnegie Institution of Washington. Washington, D.C. (1996). Wang, W., Yoder, J. H. Drosophila Pupal Abdomen Immunohistochemistry. J. Vis. Exp. (56), (2011). Sang, J. H. The Quantitative Nutritional Requirements of Drosophila Melanogaster. J. Exp. Biol. 33, (1), 45-72 (1956). Meynadier, G. Aseptic rearing of invertebrates for tissue culture. In: Invertebrate tissue culture. Vago, C. 1, Academic Press. New York. (1971). Sun, Y., Jiang, X., Chen, S., Price, B. D. Inhibition of histone acetyltransferase activity by anacardic acid sensitizes tumor cells to ionizing radiation. FEBS Lett. 580, (18), 4353-4356 (2006). Aldaz, S., Escudero, L. M., Freeman, M. Live imaging of Drosophila imaginal disc development. PNAS. 107, (32), 14217-14222 (2010). Niki, Y., Yamaguchi, T., Mahowald, A. P. Establishment of stable cell lines of Drosophila germ-line stem cells. PNAS. 103, (44), 16325-16330 (2006). Church, K., Lin, H. P. P. Kinetochore microtubules and chromosome movement during prometaphase in Drosophila melanogaster spermatocytes studied in life and with the electron microscope. Chromosoma. 92, (4), 273-282 (1985). Rebollo, E., González, C. Visualizing the spindle checkpoint in Drosophila spermatocytes. EMBO rep. 1, (1), 65-70 (2000). Cheng, J., Hunt, A. J. Time-lapse Live Imaging of Stem Cells in Drosophila Testis. Curr. Protoc. Stem Cell Biol. 11, 2E.2.1-2E.2.8 (2009).